PUGET-THENIERS, FRANCE – A French actor and a self-taught inventor have designed a low-tech machine that converts plastic waste into diesel and gasoline, which they say could help fight pollution and provide fuel for remote communities in developing countries. Proponents of plastics-to-fuel technology say the sector could be worth hundreds of millions of dollars in the next five years, and that by melting plastics into fuel they are providing a solution to the planet’s plastic waste crisis. Opponents worry that the process creates harmful fumes. “The idea is to encourage the collection of waste before it ends up in the oceans with a machine that fits in a shipping container and can create an income,” said Samuel Le Bihan, who has starred in French movies such as “Disco” and “Mesrine. For 3½ years Le Bihan has bankrolled the development of the crude machine — dubbed Chrysalis— in a hangar in Puget-Theniers in the hills behind the Riviera city of Nice. Its designer is a 35-year-old self-taught scientist. 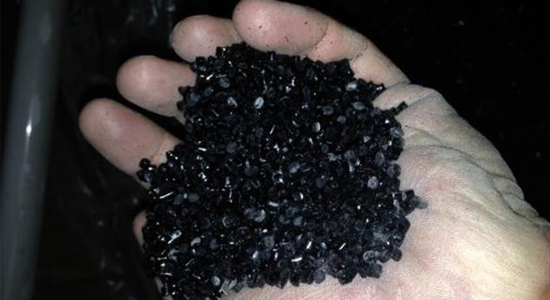 Plastic pellets are fed into a closed reactor, where they are broken down at 450 degrees centigrade to produce diesel, gasoline and a carbon residue that can be used in crayons. “A kilo of plastic gives a liter of liquid. It’s separated between diesel and petrol,” said creator Cristofer Costes. With €50,000 in additional financing from the local authority, the two men plan to create a larger prototype capable of converting 50 kg of plastic into fuel every 80 minutes. Simple in design, it will be reparable even in the depths of the African bush, said Costes. Every year about 260 million tons of plastic is produced. U.N. data show 8 million tonnes of plastic — bottles, packaging and other waste — enters the ocean each year, killing marine life and entering the human food chain. Conservationists have warned that plastic pollution in the oceans could outweigh fish by 2050. Similar technologies to the Chrysalis have already been developed by companies looking to help solve one of the greatest environmental problems facing humanity. British firm Recycling Technologies says their machine — the RT7000 — can transform hard-to-recycle waste plastic into a novel raw material, called Plaxx, which can then be re-used by the plastics industry.